292 Beacon is located on the north side of Beacon, between Exeter and Fairfield, with 290 Beacon to the east and 294 Beacon to the west. 292 Beacon was built ca. 1870, one of two houses (292-294 Beacon) which form a symmetrical pair, with 294 Beacon being four feet wider. 292 Beacon was built as the home of attorney Joseph Lewis Stackpole and his wife, Martha Watson (Parsons) Stackpole. They previously had lived at 98 Mt. Vernon. 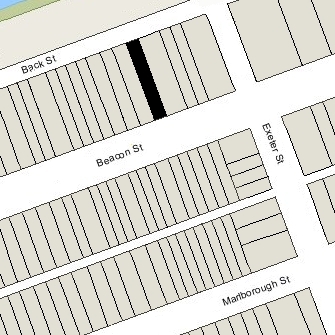 Martha Stackpole purchased the land for 292 Beacon on September 7, 1870, from the Boston and Roxbury Mill Corporation. It appears likely that the house had been built before she took title to the land. Click here for an index to the deeds for 292 Beacon. The Stackpoles raised their three children at 292 Beacon: Elizabeth Virginia (called Virginia) Stackpole, Alice Stackpole, and Joseph Lewis Stackpole, II. Virginia Stackpole married in January of 1899 to George Howland. After their marriage, they lived in Paris. J. Lewis Stackpole, II, an attorney, married in October of 1899 to Katharine Whiteside Brown. After the marriage, they lived in an apartment at 52 Hereford. J. Lewis Stackpole died in January of 1904. Martha Stackpole continued to live at 292 Beacon until her death in May of 1919. Alice Stackpole lived with her. On January 19, 1920, and May 28, 1920, Joseph Lewis Stackpole, II, acquired his sisters’ interests in 292 Beacon. 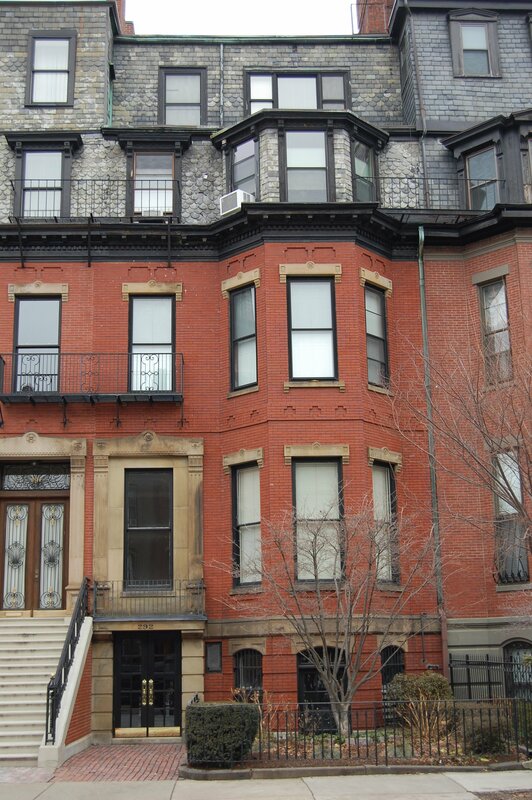 He and his wife, Katharine, lived at 287 Marlborough. On March 8, 1921, he transferred the property into his wife’s name. Alice Stackpole, an artist, continued live at 292 Beacon during the 1921-1922 winter season, but moved thereafter to 393 Beacon. By the 1922-1923 winter season, J. Lewis and Katharine Stackpole had moved from 287 Marlborough and made 292 Beacon their home. They also maintained a home in Mattapoisett. In February of 1922, they filed for (and subsequently received) permission to remodel the house, including lowering the front entrance to street level. Bigelow and Wadsworth, architects, designed the remodeling. Katharine Stackpole died in 1951. J. Lewis Stackpole continued to live at 292 Beacon until his death in August of 1953. On September 15, 1954, 292 Beacon was acquired from J. Lewis Stackpole’s estate by Hazel Olive (Townsend) Wentzel Blaisdell, the wife of Richard Howell Blaisdell. They previously had lived at 116 Charles. He was president of the Bryant and Stratton Commercial School located at 150 Newbury. Richard Blaisdell died in October of 1956. Hazel Blaisdell continued to live at 292 Beacon until 1958. On August 15, 1958, 292 Beacon was acquired from Hazel Blaisdell by Laurel (Alberta) M. (Mailloux) Moran Lowell, the former wife of Ralph A. Moran and the widow of Wharton Lowell. She lived at 292 Beacon with her son, Ralph Irvin Lowell. In October of 1958, she filed for (and subsequently received) permission to convert the property from a single-family dwelling into a two-family dwelling. In December of 1958, she was cited for exceeding the approved permit and beginning work to remodel the house into seven units. And in January of 1959, she filed for (and subsequently received) approval to proceed with remodeling the property into nine units. On April 28, 1964, 292 Beacon was acquired from Laurel Lowell by Richard Stoughton, and on October 4, 1975, it was purchased from him by Country Farm Estates, Inc. (Edward L. Britt, president and treasurer). On March 31, 1976, Judith O’Brien, trustee of the 292 Beacon Street Trust, purchased the property from Country Farm Estates. On November 10, 1977, 292 Beacon was purchased from Judith O’Brien by Alvan Mersky, trustee of L. C. Realty Trust. 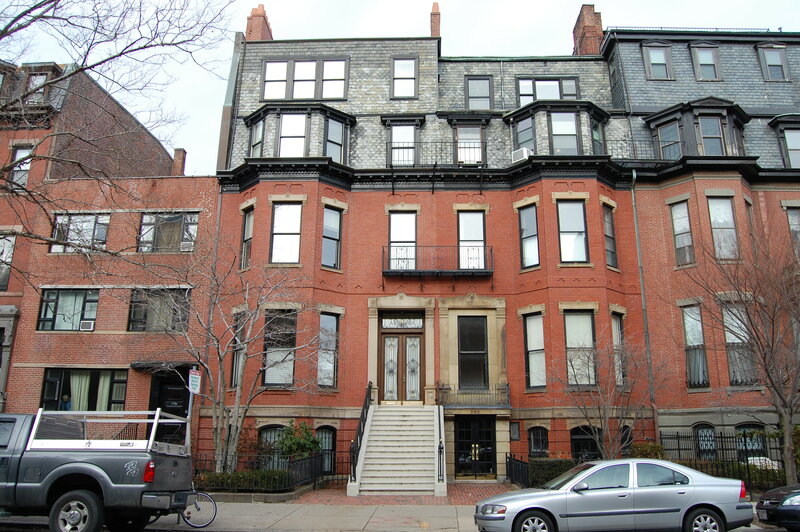 On February 28, 1978, he converted the property into eight condominium units, the 292 Beacon Street Condominium.